Remember our hooptie? It was a bit of an (okay, a huge) eyesore but it did what we needed it to do. That is, get us from point A to point B. Albeit slowly. And while making strange noises along the way. Oh, and winning us strange looks from onlookers. But bottom line, the hooptie served its purpose. We deluded ourselves into thinking this would always be the case. And of course, we were wrong. The hooptie flipped us the bird at the most inopportune time possible. But then again, that's almost poetic given the hooptie's history. Last week, I loaded up the car to go to Target. This sounds much easier said than done. See these days, it takes us an hour and forty five minutes to get ready to go anywhere. You think I'm kidding? Try feeding a baby, burping a baby, changing a baby, packing said baby's diaper bag, finding out the baby is still hungry, repeating one, two, and three, and finally, putting the baby in his car seat. Oh, and somewhere in that lineup, I checked myself out while passing a mirror and decided that not-so-attractive track pants with a small hole on the knee and a bleach spot on the ankle and big poufy hair tied with a pink sparkly scrunchy was perfectly fine for going out. By the time I loaded everyone and everything in the car, I'd almost convinced myself I didn't really need to go out. But I adjusted the rear view mirror and plastered a smile on my face because gosh darn it, having a baby wasn't going to prevent me from going to Target (my happy place). And so, I turned the key, and at that precise moment, the hooptie made a gurgling, dying noise, and I realized I wasn't going to Target after all. At that point, there was nothing left to do but admit defeat. Well, that and make cookies. 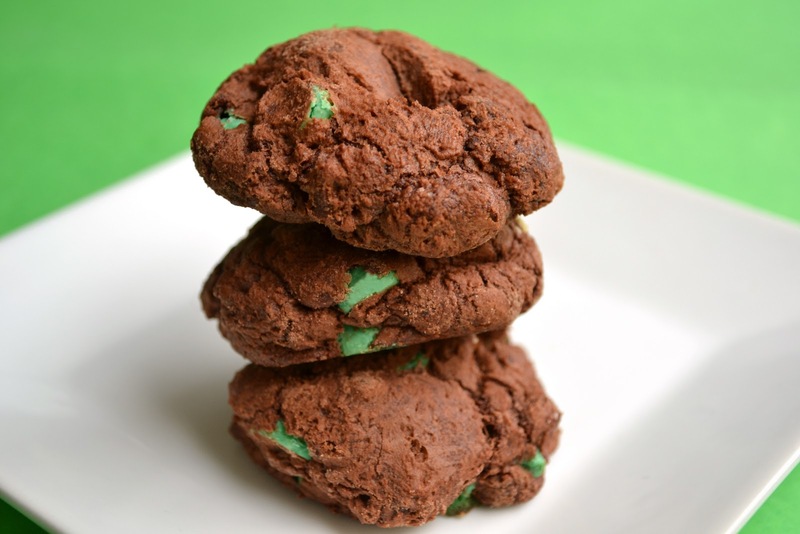 These uber chocolatey cookies with mint chips won't change your baby's diaper. They won't unpack your carefully packed car. They won't run your errands for you. And they certainly won't get your hooptie working again. But they will make you laugh about the diaper blowouts, the spitups, and that ever-present pink scrunchy. And that's almost as good as going to Target. Oh my gosh, I love mint chocolate! I've never had it in a cookie. I kind of feel like the girl who never had a skip-it. Anyways, you didn't miss much at Target. I went there this weekend and it was chaos. Did I miss the memo on Black Friday being bumped up a couple weeks? Target is my go-to spot with Rania too lol. I try to get everything ready (including myself) and wake her up from nap, feed, change diaper and then go. Makes it less hectic. Not sure about the mint-chocolate combo, I'm not a huge fan. But I'll try these with PB chips and I'm sure they will be awesome! You are handling everything so calmly! I have no idea how you do it. And make cookies? You are my hero my friend. I can't say enough good things about Target...it's my happy place as well. I hope your car gets better too! Oh man, its going to be hard finding mint chips in Pakistan! But I'm going to find a way of making these... 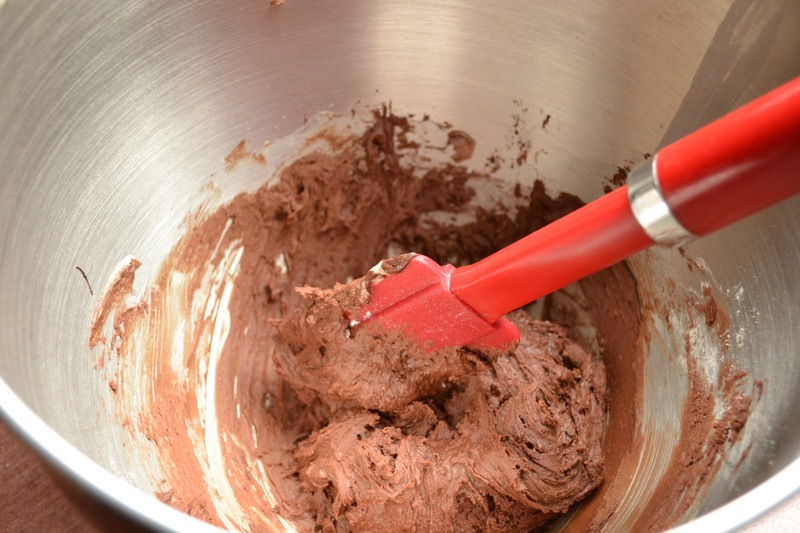 Need a major pick-me-up and what does that better than chocolate?! Oh I remember those days of diaper changes (yuck) , packing up baby things and so...so... many things to do before going out , and boy it was tough and I really feel for you when the car didn't start and at the same time , reading about your adventure really cracked me up . Keep them coming , really missed reading them . The cookies look great but not a big fan of mint flavour . Bless you, Azmina. I remember those days and you've done such a wonderful job of making me happy that they're long behind me. I remember looking at myself in the mirror and deciding that if the spit-up on my shoulder could be hidden by my hair, it was ok to go out. Hubby and Dudette would go crazy over these cookies, Hooptie or no. They look fantastic. I've been looking for the mint chips but they haven't hit over here yet. First time I've wished for a Christmas thing before Thanksgiving! 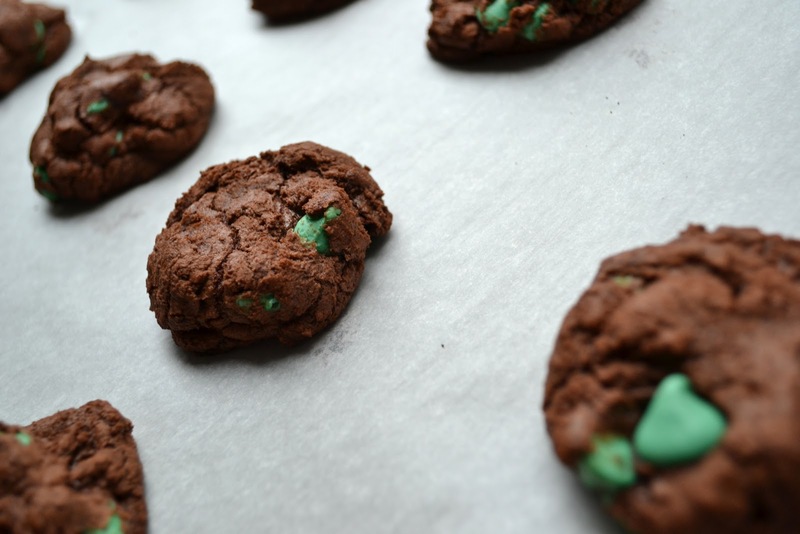 Yummilecious Azmina.... the chocolatey mint colors looks perfect for this season:) Happy thanksgiving to you!! Sounds like you are adapting to motherhood perfectly, lol. The cure for getting over Hooptie is replacing him with a younger sexier model. Lovin these cookies. Hope your week gets better. Thx for stopping by my blog & your sweet comment. Glad you did b/c now I have discovered your wonderful blog! These cookies look great...very tempting! 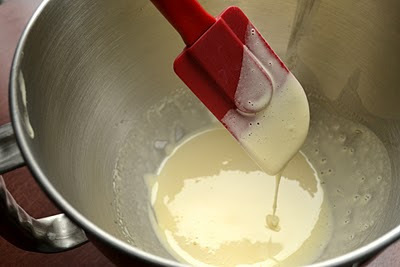 I usually avoid baking cookies b/c I can't stop myself from eating them :) Now following your blog! Just made these, with PB chips (cause that's how I roll) and they were FANTASTIC!! Thanks! I'm never going to find mint chips in India... never! sigh... the cookies look so funky with those bits of bright green peeking out!! and aaah... the poor hooptie! oops sorry, poor you i meant! :) i have a feeling our SUV that got stolen and came back a hooptie is soon going to sputter and die on us one of these days... God. 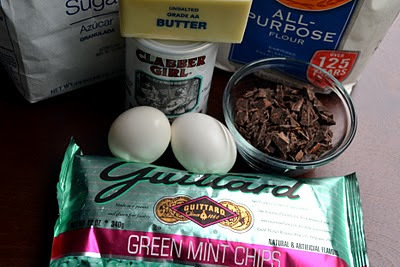 better note down this cookie recipe and go hunt for mint chips!! 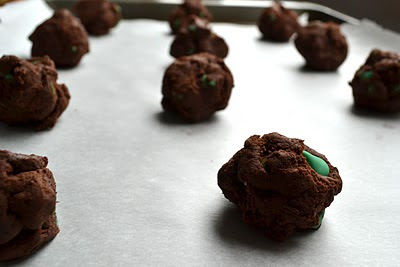 ---I love the green chips inside that chocolate. Delish Looking. I want some. It's so good that you can write about this with humor. I hope you find a nice replacement for hooptie. In the meantime, those cookies are a great way to assuage your frustrations. Smile. Your humor is a much needed trait! I wish I had as much humor with my own hooptie! These cookies look delicious. Such a great way to start my weekend. I hope you have a fabulous day! Great recipe ! I made it! It`s delicious!!! And it looks great , too! This is too much. I thought I had seen it all. My daughter will fall in love with them. target is also my happy place!